What an honor! I’ve been asked to give the audience film award at the Short Films Long Night film festival held by the General Consul of Switzerland Jean-Francois Lichtenstern. For the 4th consecutive year this event screened short films made by or with Swiss talents. Here is the link. The General Consul Jean-Francois Lichtenstern, filmmaker Roman Wyden and the Swiss Creative team put together a very nice night with great sponsors. It is always a pleasure to get together with the Swiss community and to meet new friends. 15 short films were screened at Harmony Gold Theater in Hollywood competing for 3 different awards. The 100% Swiss award is for films made entirely by Swiss filmmakers. The Here and There award is for films that aren’t completely Swiss productions but featured Swiss talent. Finally the attendees of the festival voted on the Audience Award. About 15 short films were screened at the Harmony Gold Theater in Hollywood. With Helmuth Bell, a few minutes prior giving the audience award to Yangzom Brauen. Can’t wait for next year! Hopefully I’ll get to work with Yangzom Brauen by then since I really liked her Audience Award winning film Ruprecht. It was hilarious! And the cinematography of her film was energetic. Congratulations to all our talented filmmakers! We are very proud of you. 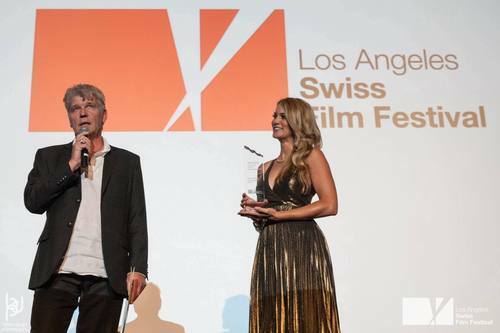 Keep making films and please submit them again next year, for the 5th annual ‘Short Films, Long Night’ Los Angeles Swiss Film Festival.